STAINED GLASS THEMES for Cushion Designs inspired by Early Modernism, the Prairie Style and Scottish architect Mackintosh, are NOW AVAILABLE! 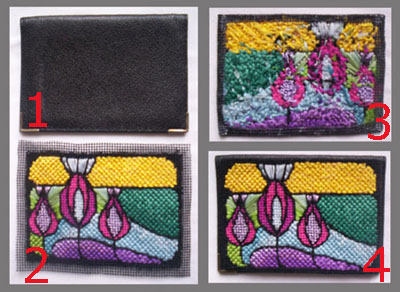 We’ve created a luminous stained glass free design called ‘SPRING BLING’ for a coin purse or card holder case featuring a new stitch to learn….. the SPLIT STITCH . To help us achieve this translucent effect, we also used the Sloping Bargello Stitch (#0902 newsletter) and the Brick Stitch (#1313 newsletter). STAINED GLASS CUSHION DESIGNS ADDED TO ZIVA’S COLLECTION! Four new designs are now available of stained glass cushion motifs inspired by the design movements of the early 20th century …. 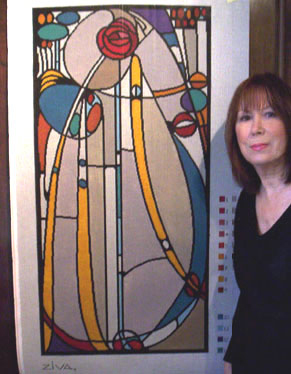 from Early Modernism to iconic architects Frank Lloyd Wright and Charles Rennie Mackintosh. Their dynamism and elegance are timeless! More samplings of recent paintings ! IT WILL LOOK STUNNING FINISHED AS A WALL TAPESTRY! We’ve just completed painting a delicate Art Nouveau cushion design (above) called ‘SPRING BUDS’,created in a subtle spring palette of cream, light gold, soft grey, mauve and mauve-blue. I’ve also included a close-up (top right) of the Spring Buds motif to show you the painting detail required to create this delicate design on 14 mesh canvas. By ‘STITCH PAINTING’, we create a precise stitching guide ….. no guesswork so it’s more pleasurable for you! The SPLIT Stitch,because of its delicacy and fineness, works perfectly as the ‘lead’ to outline the ‘stained glass’ panels of our free design motif ‘Spring Bling’. Bring the needle up at 1 and go down at 2 , at two canvas threads away. Bring the needle up at 3 , mid-point between 1 and 2, piercing the thread in the middle. Take the needle down at 4 ( 2 threads from 3, but only one thread from 2) and come up at 2, splitting the second stitch. Continue in this way. To form a smooth line, it is important to always come up in a hole that has previously been used for going down. On straight lines, the size of the stitch may be increased, but on tight curves, the stitch must be kept short. NOTE: We used various types of cotton thread to enhance the stained glass effect and doubled it on the needle to be sure of full coverage of the 14 hpi canvas. Keep practicing following the sequence of stitching in the chart until you feel confident. Then you are ready to stitch the free design. We adapted an original Art Nouveau stained glass panel to create a dynamic motif of spring buds emerging through the ground in a blaze of dazzling colours….. reaching for the warm spring sun! NOTE: We selected this small stained glass motif in order to show you various yarns and stitches you could use for depicting a stained case effect. 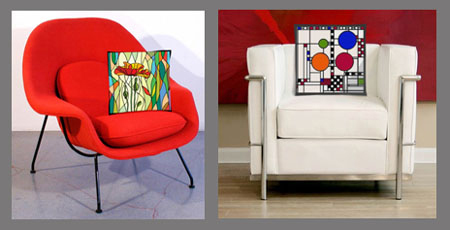 A perfect reference if you choose one of our new stained glass wall art, tote bags or cushion designs to stitch! The chart above shows the distribution of the colours complete with the shaded colour effect for the illusion of light through stained glass. The remaining colours are stitched in the Brick Stitch or Bargello Stitch. Our objective was to have the yarn types, colours and stitch types working together to create a radiant stained glass effect. Effect Created: the satin yarn, with its higher sheen, picks up the light, which in turn is affected by changing the direction of the brick stitch. 2. Green Colour: We combined three green cotton floss colours (light, medium and bright) using the Sloping Gobelin Stitch and the Brick Stitch. Effect Created: By stitching the green from light to dark on a slope, it gives the impression that light is shining through the top. 3. Spring Buds: The Split Stitch creates small delicate bud shapes for filling with the Tent Stitch and the Sloping Gobelin Stitch in brilliant colours of fuchsia, red-purple, mauve and light blue. Effect Created: The ‘Light Effects’ yarns in mauve and light icy blue definitely provide the desired luminescent stained glass effect. Effect Created: The high sheen of the yarns, particularly the silk, provides the luminous effect we wanted. 5 and 6. Turquoise and Blue colours: The same method as #4 with the random use of ‘light effects’ yarns and a range of colours from light to dark ….. all in vertical or horizontal Brick Stitch. Effect Created: A translucent sense of transparent light through these panels is created. For quantities of each yarn colour, as a guide, allow two skeins per colour to allow for doubling the thread on the needle. White 14 mesh (hpi) interlock canvas. 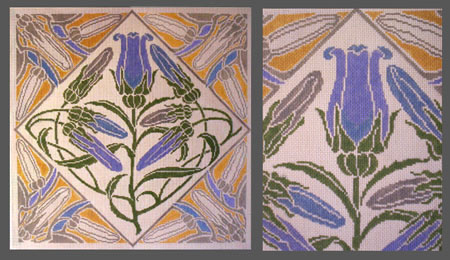 The finished size of the motif is 4.5” x 3.25” ( approx. 11.5 x 8.25 cm). 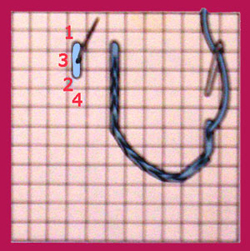 Always allow 1” – 2” on all sides of the stitched area. Using the chart as your reference, stitch the black outline of the motif in the Split Stitch first, then stitch the border in the Tent Stitch. 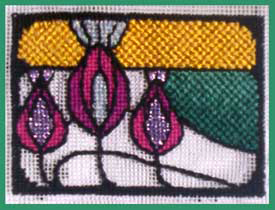 Next stitch the three spring buds motif in the Tent Stitch and the Bargello Stitch. For the card holder case, you can attach it to a purchased card holder case as shown below or make it up in fabric or simulated leather. Image One: We’ve taken a purchased standard card holder case at approximately 5” x 3.5” (12.5 x 9 cm). Image Two: We painted the bare canvas in black acrylic paint for about ½ “ around the perimeter. We then trimmed the canvas to approximately 4 threads wide. Image Three: We turned the canvas to the back and glued the edges down with fabric glue. Image Four: The canvas was attached to the card holder, again with fabric glue. It’s now an elegant case for my credit cards in my small black leather evening bag! “Thank you contacting us at ZIVA Needlepoint Designs. Because it is woven, we recommend evenweave canvas for large projects, such as cushions and seat covers or any item where ‘give’ is a definite requirement. By the nature of the material i.e. woven, it provides this important feature. I use evenweave canvas almost exclusively when painting needlepoint canvases for my clients. On most of our free designs projects, which are usually small, we use Interlock canvas. Because the thread intersections are fixed, there is no chance of it unravelling. 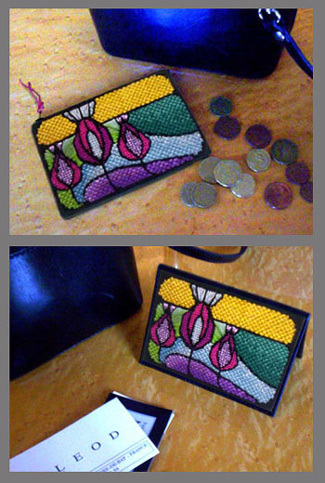 Therefore you can cut the canvas very closely to the finished tapestry, just as we demonstrated in this newsletter when making up the card holder case. For cushions and particularly seat covers, mono interlock canvas does not ‘give’ and so a thread could easily snap with wear, leaving a hole in the canvas! I hope this brief guideline has been of help to you, Caroline. The next VIVA ZIVA! Newsletter #1722 will be issued in the fall of 2017 .